- 24 carrot gold; woman looses her wedding ring and 16 years later it is found in her garden by a carrot. Amazing. - check out a beautiful home tour and interview with my sweet friend Claire. - what we learned about ourselves in 2012, a year in psychology. - wishing I could buy this dreamy case study home in Ojai. - two recipes from John Cage. - this beautiful passage from The Master of the Eclipse. I also wanted to say that I am so grateful for you, yes you. You who visits the blog, and you who continues to support me and what happens here, and you who sends me emails and leaves amazingly generous and encouraging comments. Some days I feel I am talking to no one, perhaps only myself, and I have times when this all feels futile. And it's you who remind me that it's not. So, thank you. Here here to YOU! 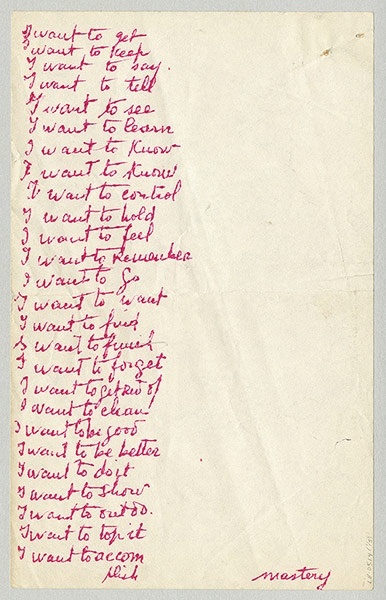 Louise Bourgeois "I want to..."
I've been obsessing over that Ojai house for a year. Dreamy indeed. i finally figured out how to set up a blogger profile and now i can comment to my heart's content ;) thank you for including me in this wonderful list. and .......... here's to YOU for making the internet a more beautiful place ! !! sooooooooooooo grateful for you three ladies!